The bottom line: There are many circles you can draw on our planet for which you can say “More people live inside than out.” There are even more ways you can subdivide our planet into arbitrarily-shaped regions in which half the world lives inside and half outside. But only one of these divisions gets to boast “Smallest such contiguous area” or “Tightest such circle”. This post takes you to it. In 2013 Ken Myers guessed and verified that his Valeriepieris circle – a circular region on a 2-dimensional map, centred in the South China Sea and about 4,000 km in radius – contained more than half the world’s population. 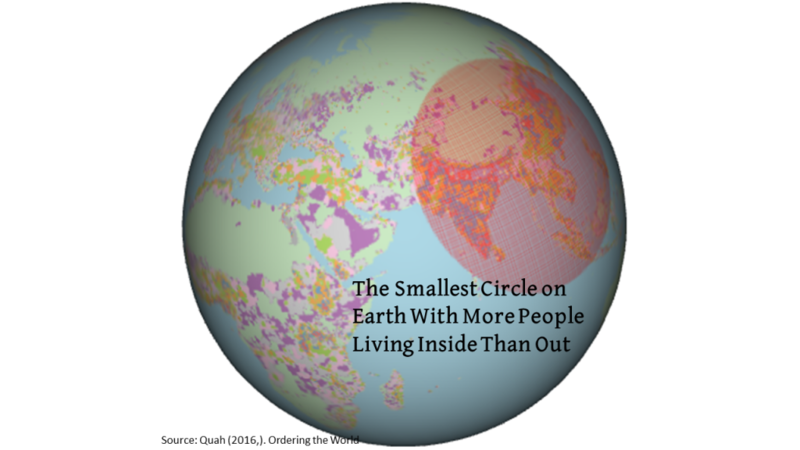 More people lived inside that one-sixth of the world’s land area than outside. and you would find — at first apparently by coincidence — half the world’s population in yellow and half the world in black. What the map points out is nothing more than the world’s most densely-populated 3-mile squares: It shows there are many in China and India, but also many in Western Europe, the US, South America, and Africa. You can select different population thresholds: instead of 8,000, suppose you choose 9,000? Or how about 7,000? Each such different choice to separate yellow and black traces out a different percentile division between the world’s most- and least-densely populated 3 mile squares. 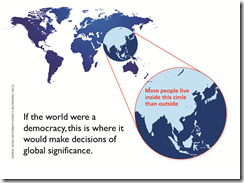 These representations bring into focus in different ways the 50th percentile of the world’s population, i.e., the simple democratic majority. They all, however, leave open the question, Where is the smallest circle one can draw on our planet that contains at least half the world’s people? I worked out (in my book-in-progress Ordering the World) an algorithm to answer that question. I addressed this question on a 3-dimensional planet, for those readers who worried about the distortion induced by the 2-dimensional projection in Ken Myers’s picture. With the help of Ken Teoh, a remarkable SEAC summer intern (a Wharton School student at the time) this month I showed that Ken Myers’s guess turned out to be remarkably close to the 2015 optimum. 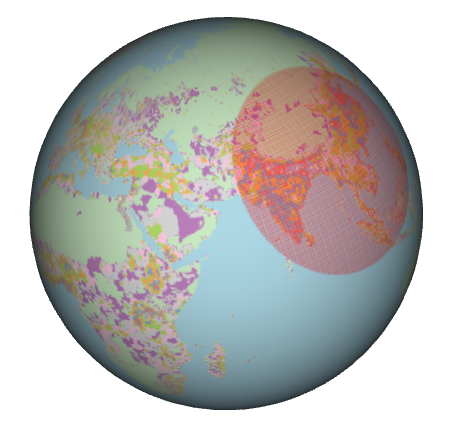 Of course, populations in different parts of our planet shift over time but in 2015, using population data with 100 km resolution on Earth’s surface, the smallest circle on our planet containing a majority of the world turns out to be that circle centred near Mong Khet, in Myanmar, with great-circle distance 3,300km. Ken’s picture stated that, there, included in his circle was more than half the world’s population. In my circle here, I ask instead, Where is the smallest circle on Earth that includes within it fraction x of the world’s population (where in my picture, for illustration, x is half – what I present here can be re-done for any x between 0 and 1). In other words, I solve a variational problem, optimizing over a parameter space that is the surface of our planet. Ken had the brilliant insight to just set down his circle. He eyeballed a map of the world and then added up the populations of countries. Ken used entire nations – India, China, Japan, and so on – to total up his population count. I instead draw on geographical data produced by agencies that surveyed and estimated population densities down to resolutions of 100km. It is possible to go even finer in geographical space, but even at the resolution I used, the computation time on ordinary LSE computers to find the tightest cluster already took days. In my calculation, parts of countries might be excluded; in Ken’s entire countries are either in or out. I cast a net of circles formed by radial distance on the surface of our 3-dimensional planet. 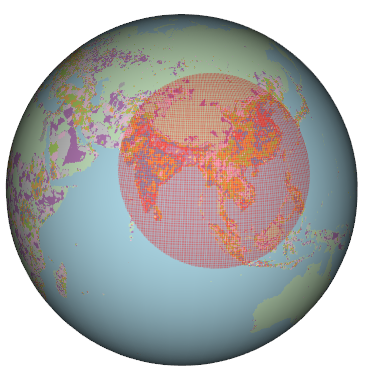 Ken, bravely, drew a circle covering a geographical expanse depicted on a 2-dimensional map. A circle on a 2-dimensional projection is, of course, not a circle in 3 dimensions, and vice versa. Noteworthy – not by design but as outcome – is that Japan is mostly excluded from my circle; it is entirely included in Ken’s. While it’s nice to be clear about all these differences – that’s what academics do – the bottom line is, on circles, Ken Myers nailed the key idea, pretty much. Max Galka’s striking picture, on the other hand, captures the difference between 3-mile squares dense with people, versus those that are not. The resulting geography is not, in itself, of central interest in that characterization of where half the world lives. By definition, Galka’s calculation traces out the absolutely smallest such area that contains half the world’s population — the result is a collection of disparate and different subareas, scattered almost randomly around the world. Postscript: In May 2016 the media team at the Lee Kuan Yew School of Public Policy at NUS produced an animation to highlight this discussion. To see it, you’ll need to be viewing this post through a browser (almost any modern browser will do) – just wait a second for the GIF to get going. This is great – a really nice visualisation with some awesome quant-work behind it. Exactly the type of proper data that is so often missing from this debate. But that’s sort of my question: what is the debate here? 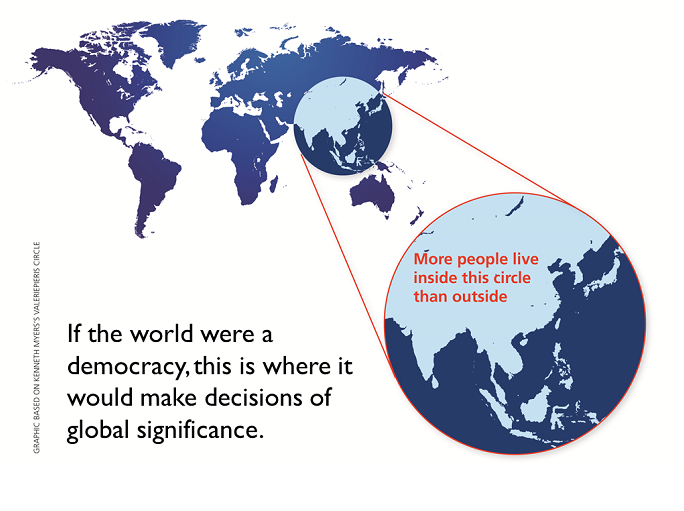 You say, if the world were a democracy, it would make decisions of global significance in this circle. That’s a leap. First of all, there’s no reason why the location that decisions are taken should correspond with where the most people physically are (though I’m not sure that’s really what you’re saying). Instead, you’ve used this phrase ‘world’s median voter’ before about this circle. But median voter is a concept based on political preference, not geographic location. If politics in your circle was particularly polarised, and preferences outside the circle were more convergent, the median voter would certainly live outside your circle. But where they actually live would be a curiosity, no more (that particular individual could be anywhere, and the individuals immediately next to the median voter geographically disconnected). I wonder what would happen if you took the world’s values and found the median position (basic things: relationship between state and market, security and liberty, prosperity and equality etc.) and found the world’s median political position, and then compared that to the values of particular countries: what would be the world’s median state? Because if the world were a democracy, that’s who you’d want your hegemon to be. You’re right, of course, that there is a presumption implicit here that people’s preferences and aspirations are tied to their geographical location. In a truly cosmopolitan world one might think that assumption would be invalid. But it is not. Nonetheless, a case needs to be made that geographical location matters. I suggest that it does matter, although obviously location cannot be the perfect and critical determining factor. First, this assumption is already implicit when we pay mind to, e.g,, the excellent Pew Surveys but also others who report their results using a geographical or nation-based setting. (I’m writing a blog entry now analyzing the Pew Foundaton’s recent “Asian views on China/Japan/US” – and obviously such a discourse [whether mine, theirs, or many others by writers elsewhere] would make no sense if we deny that geographies and nations matter, along the lines that the current entry suggests. Indeed, this implicit sense is invoked every time someone says “Power Shift from West to East”. In a related way hardly pretty much everyone intuitively understands terminology such as The American Century, even though obviously everyone is also aware that the US has a population that is deeply divided along different dimensions. Second, even if people’s preferences don’t line up exactly, what happens to their economies affects all of them – not equally but in large part, together. For instance, a particular US monetary policy that has impact on financial and real estate markets in Indonesia (say) would align Indonesians’ preferences on this policy action, even if individual Indonesians themselves feel differently about everything else. Spillovers from Indonesia to its immediate neighbors – from trade, investment, the flow of people – provide a further unifying glue. National, regional, and international economic performance affect everyone in those locations, and the joint macro effects swamp individual differences. I’ve given two instances above that would obviously need to be expanded. More can be written down (and more will be). I use the “median voter” terminology because it evokes the right ideas and images, not because it is a completely water-tight organizing concept. What is the center point of the circle? It would be interesting to see the converse, too: the largest circle, probably including Australia, Antarctica, the southern oceans, and maybe South America? It would be interesting to see the next tightest cluster of people. E.g. 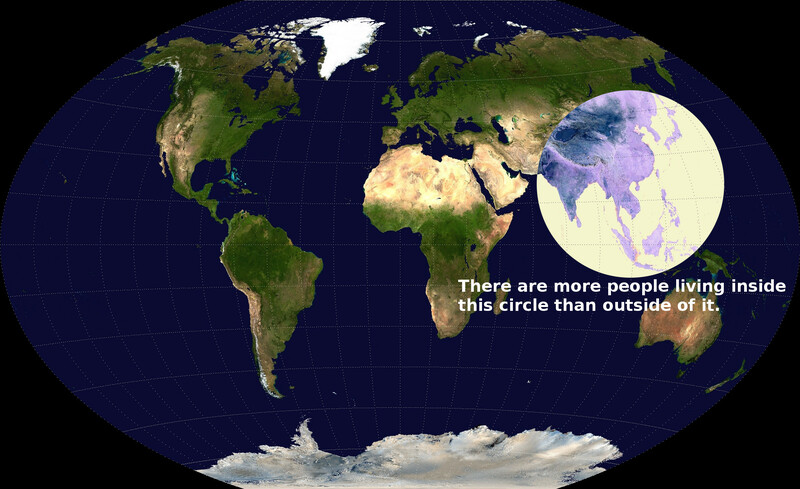 the smallest circle, not intersecting the existing circle, with half the remaining people, or 25% of the total population. My guess is that it would be about the same size as the existing one, centered over Bern.